Dr. King’s Farms™ officially began in 1985 as King’s Farm, a multi-generational, family-run farm that raised bison in western Pennsylvania. 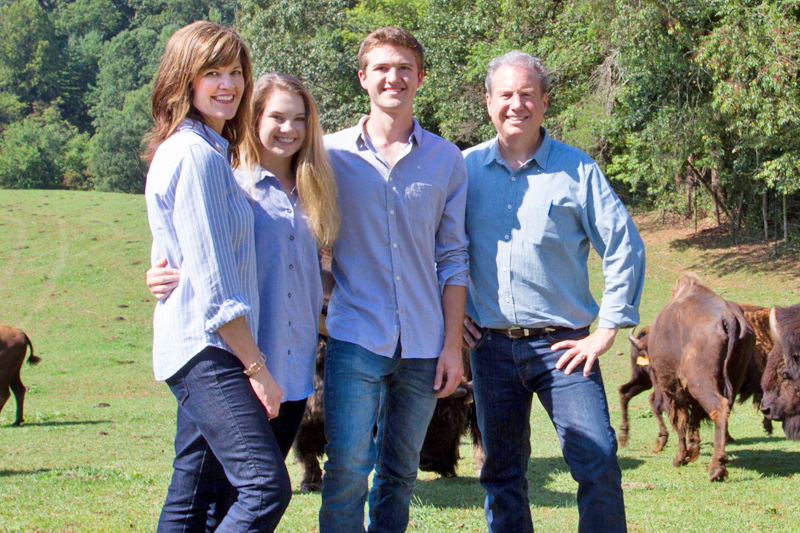 The name then transitioned to Carolina Bison Farm, with Dr. Frank King’s move to Asheville and the purchase of farmland in Leicester, North Carolina, where he carried on his family’s mission. However, the story leading up to this unique farm business is a lifetime in the making. Dr. King is a fourth-generation American farmer who discovered a passion for natural health and organic farming as a young man. His quest for healing the body, mind, and spirit led him to complete graduate degrees in naturopathy and chiropractic in 1979. On a mission to improve the health of his patients using natural methods, Dr. King began prescribing bison meat with astonishing results. As an alternative to commercial red meat, bison provided such superior nutrition to his patients, that they commonly experienced more energy, fewer digestive issues, and increased immune function. He was convinced that connecting to the diet of ancient man was an important key to health. During that time, he also made innovative breakthroughs in the 200-year-old science of homeopathic medicine. His patients and health clinic thrived. By 1989, he had relocated to North Carolina, where he founded King Bio, a natural medicine company, so he could provide the public with his new contemporary homeopathic formulas based in pure water. This move also coincided with his growing desire to not only live a healthy lifestyle, but also to share healthy food options with others through the expansion of his farm beyond bison. This expansion enabled him to research and raise various wild plants and animals, including Watusi cattle, Himalayan yak, elk, deer, camels and more. Dr. King’s core motivating principle behind his dedication to the unique living things on his farm is to provide the therapeutic foods necessary to restore human health in the 21st century. Civilization today has greatly distanced itself from the wild and powerful roots that made our Paleolithic ancestors so strong and healthy. It’s impossible to artificially create the health benefits these prehistoric wild creatures provided for our ancestors. Dr. King believes it is imperative that we steward these animals back to healthy populations so they can help reconnect us to the missing links in our own health. Because these animals ultimately nourish others with their meat and milk, Dr. King insists upon impressively high standards of care. The animals live a peaceful life grazing on lush pastures seeded with a diverse combination of nutritional non-GMO grasses. In the winter, they consume a supplemental diet of non-GMO native grass hay delivered from the Dakotas. Dr. King believes the strong genetic constitution of these animals, which enabled them to survive the Ice Age, is still delivered through their unique nutritional value. These animals carry genetic qualities that can never be found in newer domestic breeds. (Domestic breeds, cross-bred for generations, are far removed from their original, wild roots.) This dedication to genetic quality means the animals we sell to other farms for high-end breeding help create a legacy of strength. In addition, the therapeutic superfoods we sell nourish the body in a manner superior to common breeds. Dr. King’s dedication to the farm goes beyond basic business practices. He hopes to create a legacy of health for future generations. Join us on the journey and discover the difference that quality and purity make in your daily diet.